The Andertons, father Jeff and son Jason, both work at Factory_OS in Vallejo manufacturing much needed housing for the Bay Area. Jeff, who leads up the soffit framing and installation for FOS, introduced his son to the new method of building housing. Jason, who graduated from Benicia High School a bit a go has been taste testing careers and has landed on something he seems to enjoy here at FOS. 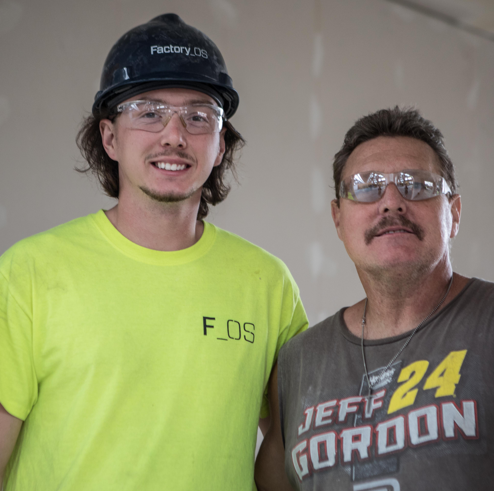 Happy to be a part of FOS, and happy to be doing something different than his dad, Jason is mastering plumbing techniques in the units just a few stations away from Jeff. So grateful to have the skills and dedication that both Andertons bring to the factory!